Lionel Messi has now gone five Barcelona games without netting as he chases goal number 500 for club and country in his career. Some are suggesting the pressure of being on 499 goals has got to the Argentine, who has scored for his country during the run, but it is not the worst spell of his career. 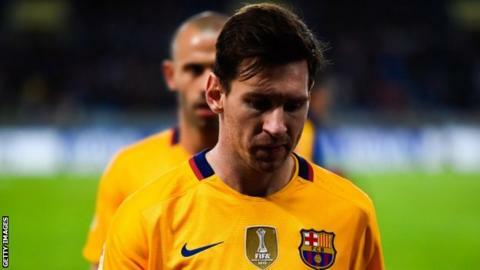 The 28-year-old failed to find the net in his first seven games for Barca as a teenager - although the only other time he failed to score in five straight club games was in April 2010. He ended it with five in the next four. By Messi's standards, five club games without a goal is quite a goal drought. Yet some of Europe's top strikers would bite your hand off for a chance to say a five-match dry run is one of the worst spells of their careers. Messi's club-mate, Brazil star Neymar, is suffering a mini-drought of his own right now. He has failed to score in the past four for Barcelona. His worst run for the Spanish giants came when he failed to score in his first six games after joining the club from Santos in 2013. He then suffered a second six-match lean spell later that same season. The third part of the feared 'MSN' trio failed to find the net in his first five games for Barcelona after leaving Liverpool in 2014. The 29-year-old Uruguay international had hit 33 in 39 games for Liverpool the previous season but that still included a run of five without a goal. He went six goals without a game when hitting 30 for Liverpool the year before that but his worse spell as an established first-teamer is nine without a goal for Ajax in 2010. Real Madrid's superstar hasn't gone more than three games without a goal for five years. February 2011 was the last time he didn't register in four games. You have to go back to the 31-year-old's Manchester United days to find a longer barren spell - 11 without a goal from November 2008 to January 2009, when a strike against Premier League whipping boys Derby ended the unwanted run. The Portugal captain still managed 25 that year and switched to the Bernabeu for £80m in the summer. Ronaldo's former team-mate at Old Trafford has had a career punctuated by questions about his form. A graph of the Manchester United and England captain's goals record looks like a rollercoaster ride. But his five game stretch without a goal this season is nothing compared to his nine without finding the net last year. His worst, though, remains 12 games - in the 2005-06 season in which he still managed 19 goals for United - and with Everton in 2003-04. Rooney's last slump in form led to calls for Leicester's 21-goal striker Vardy to replace the captain in the England team. The player of the year nominee and former Fleetwood Town man has four in his last four, including two for England - but didn't find the net for five games before that. And after scoring in 11 Premier League games in a row earlier this season, the 29-year-old didn't bag for the next seven matches. Mind you, that's nothing compared to the 23 top-flight games he went without a goal as City fought relegation last season. Fellow player of the year nominee and England striker Kane, 22, has 28 goals so far this season. The Premier League's top scorer has never gone more than four games without bagging since breaking into the side in 2013-14. Bayern Munich frontman Lewandowski, 27, hasn't scored in four for the first time this season. You have to go back to 2010-11 to find the last time the Poland striker endured a longer run that that, not scoring in 10 club games during his first season with Borussia Dortmund. Lewandowski's successor, African footballer of the year Pierre-Emerick Aubameyang, has been on fire for Dortmund this year, with 33 goals in 39 appearances. His longest barren spell without a goal in 2015-16 is just two games. The 26-year-old Gabonese was less prolific last season and went five games without a goal in November and December. But the year before that suffered a 16-game run without scoring. Zlatan has 35 for French champions Paris St-Germain this season, despite taking four games to get off the mark. The 34-year-old Sweden star went five without scoring for a spell near the start of last season after a blistering seven-goals-in-four-games start at the Parc des Princes. But you need to go back to 2008 to find a worse run, of six games while at Inter Milan. A 12-game drought for Juventus a decade ago remains the worst of his career. Serie A's top marksman, Argentina international Higuain, 28, has 32 goals for Napoli this season. He has only failed to score in more than four successive games for the club once since joining them from Real Madrid in 2013 - he went five without scoring in early 2014, ending the drought with a hat-trick against Lazio.